Do you skip pages in your bullet journal in case you need to continue a collection later? When writing in your bullet journal, how do you know how many pages to leave for what? For example, when you start a collection of all the books you’ve read, how do you know how many books you will read in a year and therefore how many pages to leave for that collection? It can be intimidating to flip the page to start something new if you don’t know if you’ll have enough room to write all the things you needed to write about a topic. Splitting Your Book In Half? Yes, I’ve heard some people start their collections at the back of their journal rather than going page by page. The problem here is you might end up with a bunch of blank pages in the middle and it may seem like the journal doesn’t flow together. To each their own though…this may not really bother you. Instead, what I do is something called “threading.” Using the index as well as the bottom of the page where the page numbers are, you can signify that a topic continues later (or earlier) in the book. There’s no flipping through to find it, no having to start over because you messed up a page. First, it will be important that your bullet journal has numbered pages. The bullet journal I use has numbered pages and a nice index for tracking what is on each of these pages. If you purchased a journal without page numbers, no worries! 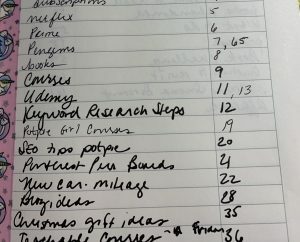 You can write in your own page numbers either before using the journal or as you go. Next, you’ll want to have an index page in your bullet journal. My favorite notebook for bullet journaling has this built in, but if yours doesn’t you can make this yourself as well. Make your own index if your book does not have one. 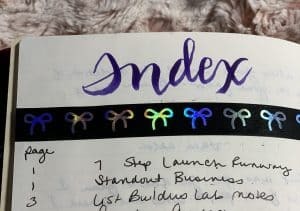 What is a bullet journal index and how do you use it? An index is similar to a table of contents in a book. 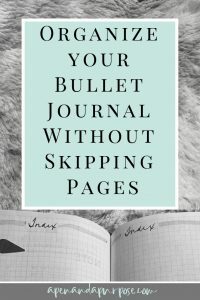 It’s a page where you keep track of what’s in your bullet journal and on what page. This is my absolute favorite thing about using a bullet journal. I know where to find things in the future without having to go through all of the pages of my book to find it. I also like that at a glance I can see what I all have included in the book. So what is threading exactly? Threading is a technique to show how a topic “threads” throughout your book. 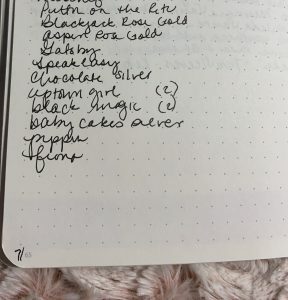 Using the index and page numbers, you easily show where a topic picks up later in your journal It reminds me a bit of a newspaper (do people still read those on paper?) where the article says continued in section B page 6, but MUCH SIMPLER. Let’s say I start a page called “Funny Things My Dog Did” where I’m collecting funny memories about my dog. I would go to my index and write the title in the index along with the page where this collection is so I can find it later. I write a few things on that page and even though I don’t know if I will need additional pages to hold all my dog’s antics, I still use the next page for something else. I don’t leave a blank page in between. The next page may be a weekly or any of the 145+ collection ideas I wrote about here. I do not worry about whether I might need the next page for funny things about my dog. If I need more space for writing funny things my dog did, I would just write them on the next available page, even if it is way later in my book. Then in my index I will show that the collection “Funny Things My Dog Did” is continued in the future by adding a comma and the next page number where it is located. After that, I’d go to page 120 and do the same thing, but I would put the 23 before the number 120 to show that it is on a previous page within the book. 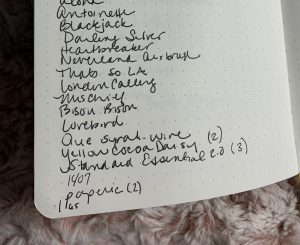 Here is an example from my bullet journal where I’ve tracked my huge Pengem collection. As you can see the collection started on page 7 and then continues on page 65.